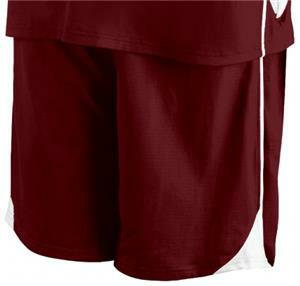 Warrior Mens Liberty Lacrosse Game Shorts. Solid body with flared dazzle side inserts and piping down both sides of inserts to match jersey. 1 1/2" covered elastic waistband with inside drawcord, and 9" inseam. Embroidered Warrior logo on right hip. Made of 100% eXtreme Mesh cationic colorfast polyester 70 denier tricot mesh with moisture management treatment. Solid body with flared dazzle side inserts and piping down both sides of inserts to match jersey. 1 1/2" covered elastic waistband with inside drawcord, and 9" inseam. Embroidered Warrior logo on right hip. Made of 100% eXtreme Mesh cationic colorfast polyester 70 denier tricot mesh with moisture management treatment. Top notch product at a great price. Thanks EPIC!! Good Quality price is unbeatable!!! Great shorts. They are very comfortable and well made. I liked it so much I ordered more!